Solar PV seems to be everywhere in the environmental news as many companies around the world are working in this segment. 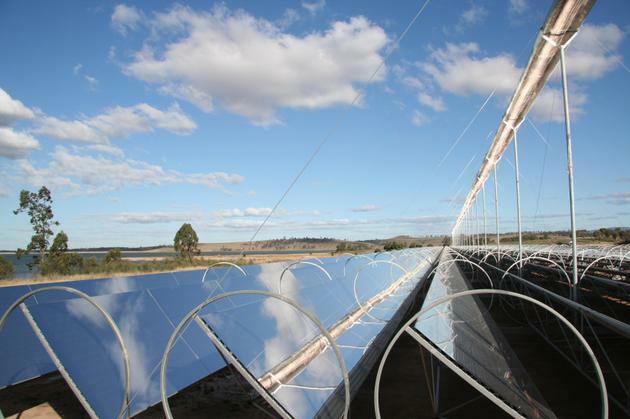 Meanwhile, little is written on the amazing potential of solar thermal. This may change soon. A US company specialized in solar thermal claims that Concentrated Solar Power (CSP) could bring 90 percent of the country’s electricity just by using the equivalent of 10 percent of the Nevada desert. Even if this sounds too big to be true – as with the Pickens plan – if only a fifth was actually carried out, it would change for ever the way we look at renewables. Solar-power-plant company Ausra has released a paper claiming that solar-thermal electric technology can provide 90 percent of U.S. grid electricity, with enough left over to power a fleet of plug-in electric vehicles. The company estimates that such a changeover would eliminate 40 percent of the country’s greenhouse gas emissions with a land footprint of 9,600 square miles, about the size of Vermont. The key to the scenario, however, is developing the ability to store energy for 16 hours, thus creating a stable power source through cloudy periods and the night, a feat that has so far eluded engineers. The paper says Ausra expects to commercialize its energy-storage technology within two years. A prototype of the system will go into a model plant the company plans to finish this summer in Bakersfield, California, the company’s founder, David Mills, told Wired.com. The new research (.pdf) was presented at the IEA SolarPACES conference in Las Vegas, and is described as peer-reviewed. Solar-thermal power is gaining adherents, including Google.org, which cut a deal with another player, eSolar, as a way to cleanly generate cost-competitive, city-scale amounts of power. Unlike traditional photovoltaics, which use panels to convert sunlight into electricity, solar-thermal plants focus the sun’s rays on liquids to make steam that powers turbines. Solar-thermal is flat-out more efficient — at 20 to 40 percent — than photovoltaics, which in the field convert sunlight to electricity at about 15 to 22 percent. And solar-thermal fits into the industrial model of power production, meaning that it works in big plants, not distributed across a bunch of houses and buildings. Mills’ paper reveals some interesting statistics about the construction cost of solar-thermal technologies: $3,000 per kilowatt of capacity, but estimated to drop to $1,500 per kW over the next “several” years. The New York Times last year quoted GE Energy executives giving construction costs for coal plants at $2,000 to $3,000 per kilowatt. Ausra says it can generate electricity for 10 cents a kilowatt hour, which is close to the cost of natural gas, and it expects the price to drop even further. The company has received a lot of attention because of its compact linear Fresnel-reflector technology, and because it lined up two big-name VCs early: Vinod Khosla and Kleiner Perkins, where Al Gore is a partner. It’s received $43 million in venture capital, and an additional $30 million at least in venture debt. It’s planning a $100 million-to-150 million funding round later this year. And you, what do you think about this topic ? Please don’t hesitate to leave a comment as I would gladly read you. Thanks Meryn. I will have a look soon at Friendfeed. But once again, I am really afraid to be involved in too many things around here on the Internet (see the seven hearts below). IRL stuff is important too. In any case, be sure that when it will happen, you will know it.